Long sleeved. 2 pockets to front and hidden button fastening. Lovely quality shirt in good condition. Length from centre back neckline = 24". 2" side slits. Beautiful blue and white striped top from Marks and Spencer, with part smock elasticated bell sleeves. Button neck back fastening with keyhole detail. Length: 24". Underarm to underarm: 24". LADIES M&S BLUE/WHITE 100% LINEN CHAMBRAY STRIPE LONG SHIRT. SIZE UK 18. ARMPIT TO ARMPIT: 23". Size 20 Lilac Striped Blouse From Marks And Spencer , button front fastening, 3/4 sleeves, contrasting collar and cuffs. Ex display item, new without tags. Dispatched with Royal Mail 2nd Class. m & s embroidered blouse. Condition is Used. Dispatched with Royal Mail 1st Class. M & S PETITE Top NEW Size 10 . Condition is New with tags. Dispatched with Royal Mail 2nd Class. Ladies Marks And Spencer Black And White Striped Top - Size 10. In excellent condition. Marks And Spencer Ladies navy blue and cream striped top size 1 8. Marks and Spencer Short Sleeve Women's T-Shirt - Size 18 - Lime Mix. Dispatched with Royal Mail 2nd Class. M&S. Striped Cream / Black, Vest / Cami Top. Size 12. Worn Once. Lovely vest. Only worn Once. No longer fits. From a clean, smoke and pet free home. Ladies Marks and Spencer stretch blouse, Colour: white with black stripe details, Size: 14. Great used condition. 3/4 length sleeves. Pull-on design. M&S ladies white shirt with Pale blue stripes. 55% linen 45% cotton. button up top/shirt with tie back. M&S Blue Striped Blouse size 10. Linen style fabric perfect for spring/summer. Nice tie detail belt to front or back however preferred. Dispatched with Royal Mail 2nd Class. Very good: item used, but no signs of wear, no splits, tears, fraying, colour loss or missing buttons etc. Funnily no one ever complains about that! top in a size 14, bust 38" and 30" shoulder to hem. M&S Limited Edition Blue & White Stripe And Flower Print sleeveless Top Size 10. Striking ruffle detail to sleeves and tie neck. Hardly worn and in excellent condition! Smoke and pet free home. Dispatched with Royal Mail 2nd Class. Please see other otems I am selling! Marks & Spencer Cotton mix tie waist top size 18. In immaculate condition. Worn once as wrong size. Marks And Spencer Collection Peach And White Stripe Blouse Size 18. Breast pocket detail. Collar and cuff polka dot detail on reverse. M&S Bright Red Stripe Top 3/4 Sleeve Tee 14. Condition is Used. Dispatched with Royal Mail 2nd Class. 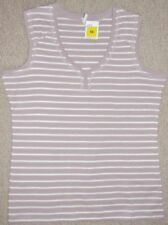 Marks and Spencer Black And White Striped Top Size 10 BNWT. Condition is New with tags. Dispatched with Royal Mail 2nd Class. Versatile top which can be worn on or off the shoulder. New condition. Having a clear out so please look at my other items. Any questions please ask. Thanks for looking. Pretty Fitted Short Sleeve Shirt Top. Cash accepted only if item is to be picked up. M&S Collection. Blue Striped Fabric. Spare Button. SIZE UK 18. ARMPIT TO ARMPIT: 23". Simple blue and cream striped cotton/linen blouse from Per Una. Full length sleeves which fold up to three quarter length with a button tab. 51% linen. 49% cotton. 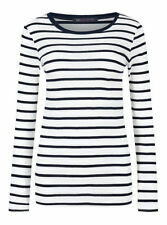 Ladies M&S Classic navy and white striped top. Size 18. A lovely top for the summer Condition is Used. Dispatched with Royal Mail 2nd Class. M&S LADIES UK 12 stripped LINEN SHIRT Worn Once. Condition is Used. Dispatched with Royal Mail Signed For® 2nd Class. MARKS & SPENCER 'INDIGO'. A LOVELY V NECK TOP. ARM PIT TO ARM PIT - 25". 90% COTTON JERSEY IN IVORY WITH A VERY FINE BLACK STRIPE. CENTRE BACK LENGTH - 26". RELAXED FIT. Marks and Spencer Striped Long Sleeve Women's Shirt - Size 6. Condition is Used. Dispatched with Royal Mail 2nd Class. 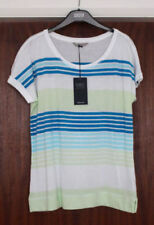 M&S COLLECTION Women's CURVE Striped Round Neck Half Sleeve Top NEW! !